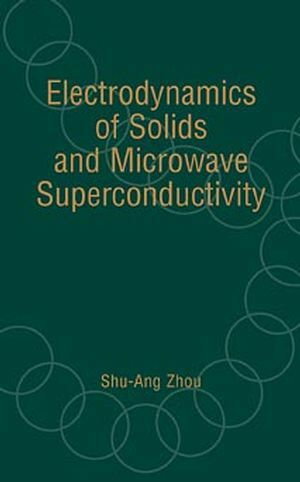 This book presents the interdisciplinary field of solid electrodynamics and its applications in superconductor and microwave technologies. It gives scientists and engineers the foundation necessary to deal with theoretical and applied electromagnetics, continuum mechanics, applied superconductivity, high-speed electronic circuit design, microwave engineering and transducer technology. Shu-Ang Zhou, Chinese, Swedish physicist, researcher. Achievements include research in electrodynamics of deformable superconductors and bio electrodynamics in living organisms; invention of microwave superconductive transistor-like device; patents for radio frequency devices, such as RF filters and switching devices. Zhou, Shu-Ang was born on August 24, 1954 in Shanghai. Bachelor of Science, Fudan University, Shanghai, 1982. Doctor of Philosophy, Royal Institute of Technology, Stockholm, 1988. Achievements include research in electrodynamics of deformable superconductors and bio electrodynamics in living organisms. Invention of microwave superconductive transistor-like device. Patents for radio frequency devices, such as RF filters and switching devices. Continuum Electrodynamics of Deformable Solids. Electrodynamics of Superconductors in Weak Fields. Electrodynamics of Superconductors in Strong Fields. Electrodynamics of Josephson Junctions and Circuits. Electromagnetic Analysis of Transmission Lines and Waveguide.